Ashley Morris in action for Panthers. Promoter Ged Rathbone has told his Peterborough riders it’s time to stand up and be counted. The Panthers begin a run of four make-or-break home meetings in the space of nine days, which will almost certainly decide their Premier League play-offs fate, when they entertain Newcastle tonight (August 26). And Rathbone insists there can be no excuses for a failure to perform when his men chase revenge against the Diamonds at the East of England Showground (7.30pm). Not only will Peterborough be fuelled by the disappointment of a 59-34 defeat at the hands of the Diamonds last Sunday, they also need to address their below-par home record after suffering five Alwalton defeats so far in 2016. Rathbone said: “We have been ever-present in the play-off positions since the start of the season and we have to ensure we stay there. “We have four successive home meetings in which to pick up the points we need to keep ourselves inside the top six and in with a chance of winning the league. “I don’t think the team has completely clicked all season and we need that to happen now. “The supporters have made it very clear, since the defeat at Newcastle, that they would like to see changes. “Myself and the rest of the management team are well aware that we haven’t quite been getting the performances we expect from some areas of the team. “Now it is up to the guys to stand up and be counted by getting the result we need tonight, again on Bank Holiday Monday, and in the double-header next weekend. Peterborough slipped to fifth position in the Premier League standings following their heavy loss at the hands of Newcastle last Sunday. It was a result which also lifted the Diamonds into the final play-off place. The visit of Newcastle is followed by an Alwalton date against Redcar on Bank Holiday Monday (7pm) before Peterborough face both Rye House and Workington in a September 4 double-header. PETERBOROUGH PANTHERS: Craig Cook, Emil Grondal, Zdenek Holub, Nikolaj Busk Jakobsen, Ashley Morris, Ulrich Ostergaard, Tom Perry. 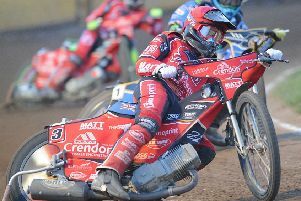 NEWCASTLE: Matej Kus, Robert Lambert, Ludvig Lindgren, Victor Palovaara, Danny Phillips, Lewis Rose, Steve Worrall.